2018 International Healthcare & Medical Cosmetology Expo_NEWS | Mitsubo Enterprises Co., Ltd. It is MITSUBO's pleasure to see you in 2018 International Healthcare & Medical Cosmetology Expo held in Taipei (Taipei Nangang Exhibition Center) from July 19th to July 22nd. We show up here every year as always! Propolinse mouthwash, the best-selling Japanese propolis mouthwash that MITSUBO solely distributes in Taiwan, is highly rated by consumers. It is generally recognized for its immediately visible cleaning effect, and is so hot sale that MITSUBO always receives feedback from the consumers that Propolinse mouthwash is out of stock no matter on online shops or brick-and-mortar stores. For this reason, MITSUBO specially shows all types Propolinse mouthwash during the four-day exhibition for consumers to try: top-seller original flavor “Propolinse Mouthwash”, cleaning and whitening at the same time “Whitening Mouthwash”, sweet and romantic “Sakura Mouthwash”, super effective specially for smokers “Refresh Mouthwash”, and Japanese style “Macha Mouthwash”, and so on. How wonderful it is to have all of them at the same time! Organic Essence, American leading organic brand that MITSUBO solely distributes in Taiwan, always ranks top and stands out from all the organic competitors. Their USDA organic certified ingredients and lovely echo-friendly paper packaging have consumers' attention and are great for both kinds and adults. MITSUBO picks up the bestseller “Organic Lip balm” and summer’s must-have “Organic Deodorant” for you. You will not want to miss it! 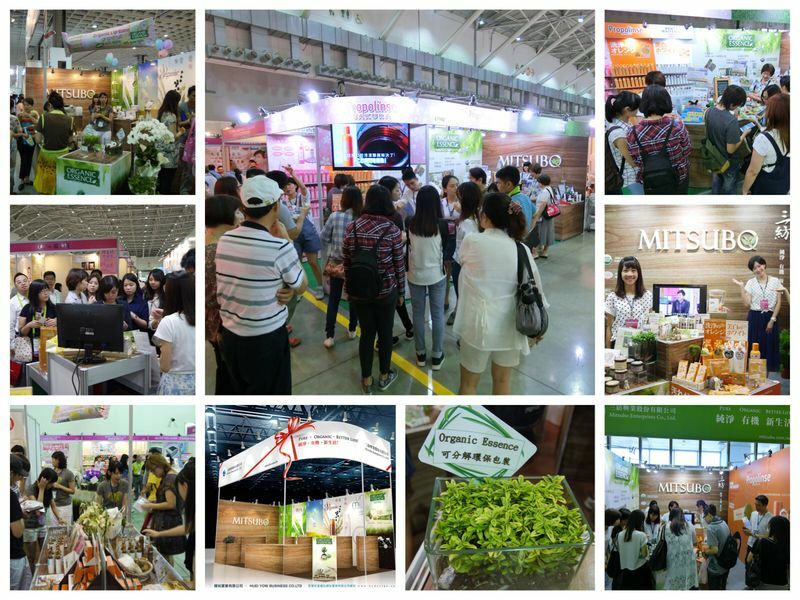 Moreover, MITSUBO is going to be the solely agent of a Korean salon shampoo "Jenny House", Russian Office ladies' favorite "BLOOM", and Thai natural hot-seller "O-SPA". This shampoo has unique and innovative formula that has amazing 3D volume-boosting effect and enables hair to stand up from the roots. It has struck a chord since it released to the Korean market and many Korean celebrities are using it. It is estimated extremely high as “magic shampoo” by Korean consumers. This magic shampoo has not been on the shelf in Taiwan, MITSUBO specially takes this exhibition as tjheir debut for you. During July 19th to July 22ns, MITSUBO prepares free testers. We sincerely invite you to have fun with us in booth K1205.